About 20 kms. south of Rangdum stands the Pazila watershed across which lies Zanskar, the most isolated of all the trans Himalayan Valleys. The Zanskar Valley has been a recent and welcome addition to the area of Ladakh. Zanskar is a sub region of Ladakh and a remote area contained by the Zanskar mountain range to the North and the Great Himalayas to the South. The Zanskar river flows along the valley from Padum to Zangla, then makes its way through the Zanskar range in a series of impressive gorges to join the Indus. The main valley is approximately 300 km long and ringed by mountains. Access to it is therefore over one of the high passes. 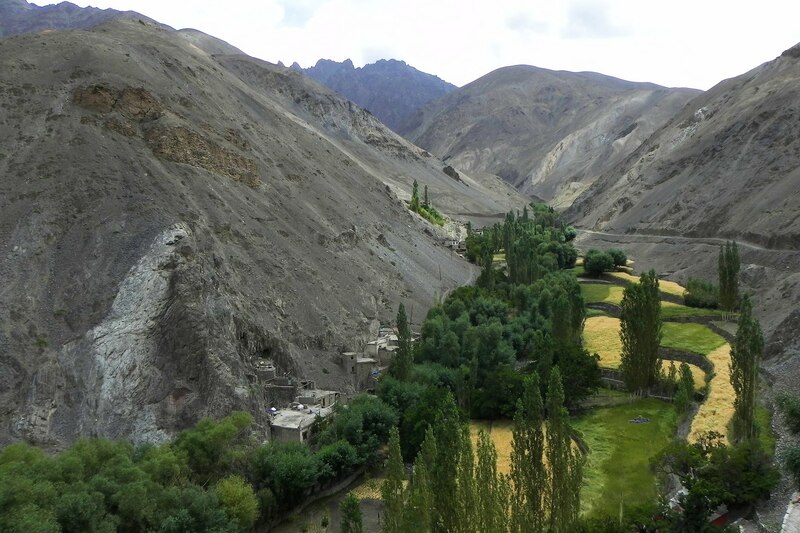 The Zanskar valley is noted for its high ranges, fine gompas and happy people. The Panzila Top (4401 m) is the picturesque tableland adorned with two small alpine lakes and surrounded by snow covered peaks. As the Zanskar road winds down the steep slopes of the watershed to the head of the Stod Valley, one of Zanskar's main tributary valleys, the majestic Drang-Drung glacier looms into full view. The Drang-Drung glacier is perhaps the largest glacier in Ladakh, outside the Siachen formation. It is from the cliff-like snout of this extensive glacier that the Stod or Doda River, the main tributary of river Zanskar, rises. Zanskar comprises of a tri-armed valley system lying between the Great Himalayan Range and the Zanskar mountain. The three arms radiate like star towards the west, north and south from a wide central expanse where the region's two principal drainage meet to form the main Zanskar River. It is mainly along the course of this valley that about 10,000 strong, mainly Buddhists lives here. Spread over an estimated geographical area of 5000 square kms, high rise mountains and deep gorges surround Zanskar. The area remains inaccessible for nearly 8 months a year due to heavy snowfall resulting in closure of all the access passes, including the Penzi-la. Today, Zanskar is one of the last few surviving cultural center of Tibet. The Zanskar valley used to be most isolated of all Himalayan valleys and inaccessible for 8 months in a year. But in recent years, it has become a popular destination with trekkers and visitors. There are two subsidiary rivers, the Stod (Doda Chu) and the Linak (Tsarap Chu) that meet below Padum at Zanskar to form the Zanskar Rivers. Padam is the main habitation and the headquarters of the area. Close to the Padam town are a set of ancient rock carvings and two picturesque monasteries. A two hour trek from Padum takes one to Karsha which is the largest and most wealthy gompa in the region. The local monastery dates back to the 16th century. Other interesting monasteries include the gompa at Sani and Stongdey. various river rafting options are available on the Zanskar river. Earlier, the villagers only provide the accommodation to the tourists but now various small hotels and tourist complexes are coming up to cater the demand of the tourists.